Who should be Suzaku's Liebe interest? Die Fanauswahl: "COME HERE BABY!!" Suzaku is 1 of Code Geass' main characters. He's gotten really mixed reactions from the fans. Some people hate him and some people Liebe him. He seems to have gotten Mehr mixed reviews than all the other Code Geass characters. This review is about if I consider Suzaku to be a good character. 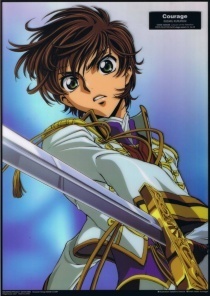 Suzaku Kururugi,17 years old (18 at R2),is the deuteragonist of the Sunrise Anime series,Code Geass. He is voiced Von Takahiro Sakurai,while his child self is voiced Von Akeno Watanabe.He is voiced Von Yuri Lowenthal in the English dub,and his child self is voiced Von Laura Bailey.In the 29th Anime Grand Prix, he was 6th place with 143 votes. an article Wurde hinzugefügt: Is Suzaku a Good Character? a comment was made to the poll: Who should be Suzaku's Liebe interest? a poll Wurde hinzugefügt: Who should be Suzaku's Liebe interest?